German aircraft carrier Graf Zeppelin was the lead ship in a class of two carriers ordered by the Kriegsmarine. She was the only aircraft carrier launched by Germany during World War II and represented part of the Kriegsmarine's attempt to create a well-balanced oceangoing fleet, capable of projecting German naval power far beyond the narrow confines of the Baltic and North Seas. Construction was ordered on 16 November 1935 and her keel was laid down on 28 December 1936 by Deutsche Werke at Kiel. 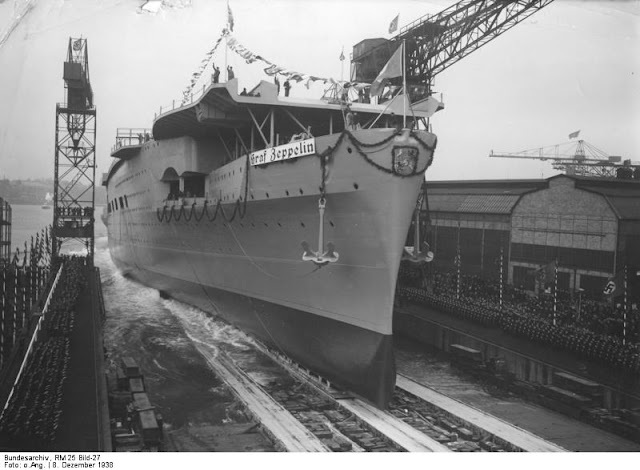 Named in honor of Graf (Count) Ferdinand von Zeppelin, the ship was launched on 8 December 1938 but was not completed and was never operational. Light armor covered the flight deck; heavier armor protected the hangar deck and machinery, and the waterline had a belt of varied thickness, 4 inches (100mm) at its thickest. For an aircraft carrier, the armament was overdone: six twin 4.1 inch anti-aircraft mountings forward and aft of the island, backed up by sixteen 6-inch guns in twin casemates just below the flight deck as protection against surface attack. She also carried eighteen 1.46 inch AA pieces. 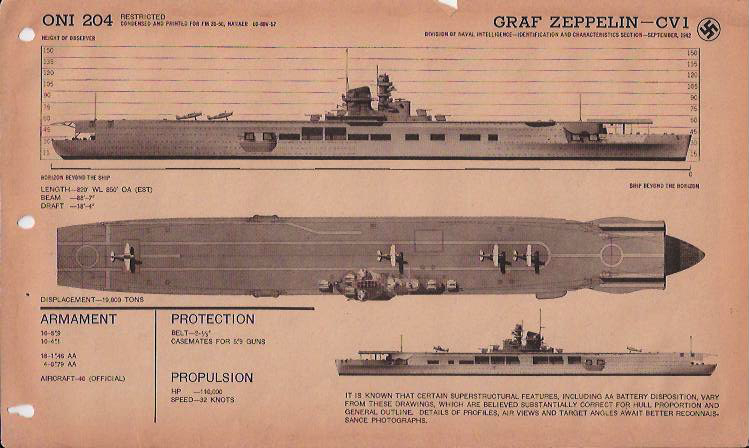 Her 6-inch guns (15 centimeter, which is more precisely 5.9 inches) typify the problems of the Graf Zeppelin. Firstly, they seem to have been completely out of place for a carrier designed in the late 1930s. The idea was that they could serve as protection against attack by surface ships, cruisers and destroyers; they also could have been used in commerce raiding if the carrier's airplanes had been used up. It seems like an odd idea in hindsight, but Japan, the United States, and Great Britain all included heavy guns on their earliest carriers. Secondly, the guns were mis-specified. 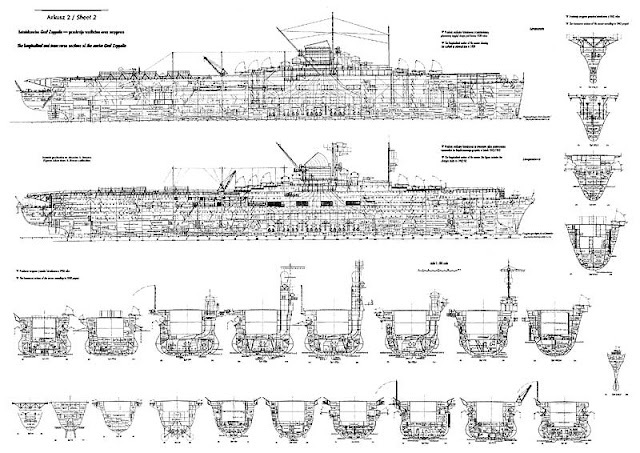 The ship's original included eight guns in single casemates, and Chief Engineer Hadeler suggested they be doubled up to save weight, two guns in four casemates. His request was mis-interpreted, and the total number of guns was doubled to sixteen, which added additional weight to the carrier. Thirdly, as the ship languished and its construction halted in 1940, the guns were stripped, and sent to Norway. For her size (23,000 tons) she was greatly overpowered, with 200,000 shaft horsepower, capable of making 33.75 knots, while she only carried 40 aircraft. She had 16 LaMont boilers, firing 4 turbines, which powered four propeller shafts, at top speed of 35 knots. Her 5,000 ton supply of fuel oil gave her a theoretical cruising range of 9,600 miles. Actual experience for both speed and range probably would have been less, but since she never put to sea, all we have are the design specifications. Since Germany had no ongoing naval aviation program and no naval aircraft in 1935, all of Graf Zeppelin's airplanes would have to be developed concurrently, either as modifications of existing land-based aircraft or as all-new naval designs. 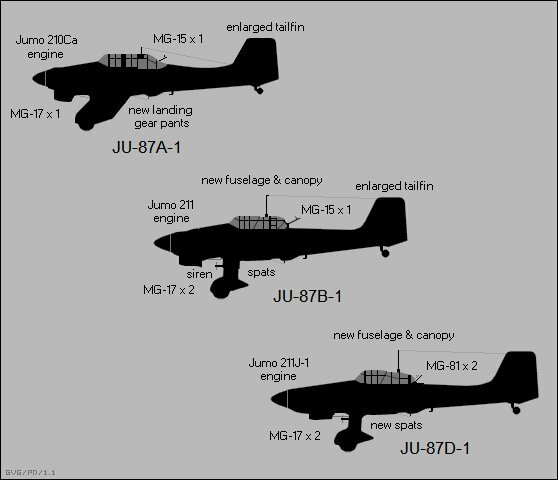 Graf Zeppelin's original plans called for twenty Fieseler Fi 167 scout/torpedo biplanes, ten Messerschmitt Bf 109T fighters, and thirteen Junkers Ju 87C/E dive-bombers. This was later changed to 30 fighters and 12 Stuka dive-bombers, as wartime experience had suggested. In 1937, the Riechsluftfahrtministerium (German Ministry of Aviation) issued a request for a naval strike aircraft, suitable for operations on the Graf Zeppelin. The specification called for a two-seat, multi-role (torpedo bombing, reconnaissance, and dive-bombing) all-metal biplane, capable of flying 300 km/h (186 MPH) while fully loaded. Fieseler and Arado submitted designs, but Fieseler's 167 was soon determined to be much better. It exceeded the design specs. Powered by a single Daimler-Benz DB 601B liquid-cooled, in-line, 1100HP engine, it was capable of 320 km/h (200 MPH) and could carry a 1,000 kg (2,200 lb.) bomb or a standard 1850 lb. torpedo. It featured folding wings for storage in a carrier's hangar, a tail hook, and a fixed landing gear that could be jettisoned in the event of a water landing. It's large lower wing flaps gave it excellent handling at low speeds, and it seemed to be able to descend almost vertically onto the deck. It carried a single forward-facing 7.92 mm MG 17 machine guns and a MG-15 machine gun in the rear. 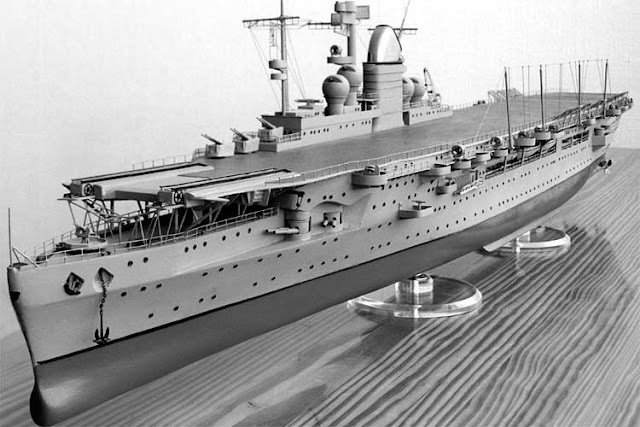 From 1938, Fieseler produced twelve pre-production examples, which of course, never saw service on the unfinished Graf Zeppelin. When the Graf Zeppelin project was briefly revived in 1942, it was decided that a modified Junkers Ju-87 Stuka would supplant the Fi 167, which was by then out-dated. Nine were dispatched to a coastal aviation patrol in Holland and were eventually sold to the Nazi puppet government of Croatia. Their STOL (short take-off & landing) characteristics were very useful in the mountainous Balkan terrain. In an interesting historical footnote, an Fi-167 biplane in Croatian service is credited with shooting down a USAAF P-51 Mustang in October 1944, one of the last recorded biplane kills of the war. In 1938, it was decided to add Stuka dive-bombers to the Graf Zeppelin's air component. Based on the Ju-87B, the "C" model featured folding wings, jettison-able undercarriage, flotation X in the wings, a tail hook, and a catapult attachment. Powered by a Junkers Jumo 211D liquid-cooled in-line engine, its top speed was 332 km/h (206 MPH). It carried a payload of 700 kg (1500 lbs. ), and was equipped with three machine guns (two forward-firing 7.92 mm MG 17 machine guns and one rear-facing 7.92 mm MG 15 machine gun). For naval service, the psychological warfare air sirens were removed from the undercarriage. Two prototypes were converted from "B" models and ten pre-production examples were built. While 170 were authorized in 1939, as the aircraft carrier program faltered in 1940, nowhere near that many were built. The Ju-87E was the proposed naval variant of the "D" model, which was proposed in 1942 during the brief resurgence of interest in the aircraft carrier. Originally, the planned fighter for the carrier was to be a variant of Messerschmitt's highly successful and adaptable Bf-109. The "T" was a modified "E" model, with a larger wing, four catapult attachment points, a tail hook, manually folded wings, and a strengthened landing gear. Its guns consisted of two fuselage-mounted 7.92 mm MG 17 machine guns, with provisions for two MG-17 machine guns or two 20-mm MG-FF cannon in the wings. A Daimler Benz DB 601 engine could power the machine to fly at a top speed of 350 MPH. After the design was accepted by the Kriegsmarine, because of the demand on production at Messerschmitt's Augsburg plant, the program was transferred to Fieseler. Ten Bf 109E-1s were taken off the assembly line and designated Bf 109T-0, as pre-production machines. Sixty Bf 109T-1s were also ordered from Fieseler. However in April, 1940, work on the Graf Zeppelin was halted, and then finally canceled in early 1943. Fieseler finished making the 60 Bf 109T-1s, but without the catapult hooks and arrester gear. Without these carrier features, they were re-designated Bf 109T-2, and were fitted with a ventral bomb rack for various bomb loads. Bf 109T-2 deliveries started in March, 1941, and most were assigned to Norway, another place where carrier-type aircraft were useful on short airfields and in mountainous conditions. 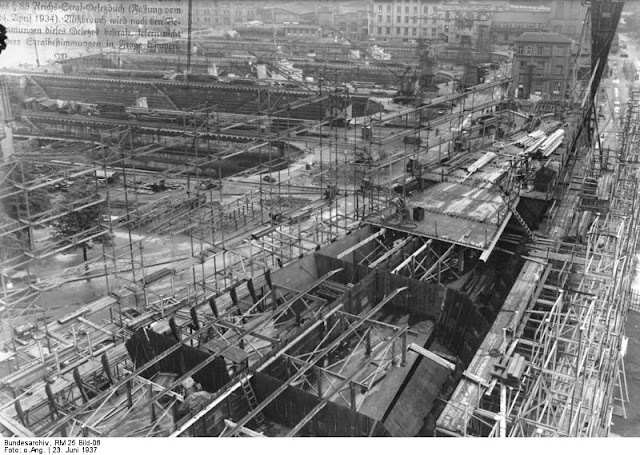 Work started on Flugzeugträger A in 1936. She was laid down on 28 December that year, and launched on 8 December 1938. Construction on the Kriegsmarine's first aircraft carrier had been fitful from the start due to a shortage of welders and delays in obtaining materials, and by the spring of 1940 she was still incomplete. Meanwhile, Germany’s conquest of Norway in April 1940 further eroded any chance of completing Flugzeugträger A (now named Graf Zeppelin). Now responsible for defending Norway’s long coastline and numerous port facilities, the Kriegsmarine urgently required large numbers of coastal guns and AA batteries. During a naval conference with Hitler on 29 April 1940, Admiral Raeder proposed halting all work onGraf Zeppelin, arguing that even if she was commissioned by the end of 1940, final installation of her guns would require another ten months or more (her original fire control system had been sold to the Soviet Union under an earlier trade agreement). Hitler consented to the stop work order, allowing Raeder to have Graf Zeppelin’s 15 cm guns removed and transferred to Norway. The carrier’s heavy flak armament of twelve 10.5 cm guns had already been diverted elsewhere. On 12 July 1940, Graf Zeppelin was towed from Kiel to Gotenhafen (Gdynia) and remained there for nearly a year. 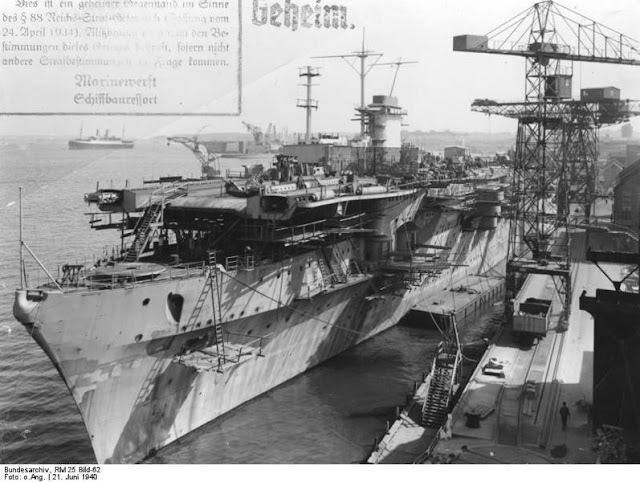 Just prior to Germany's invasion of the Soviet Union in June 1941, the carrier was again moved, this time to Stettin, in order to safeguard her from Soviet air attacks. 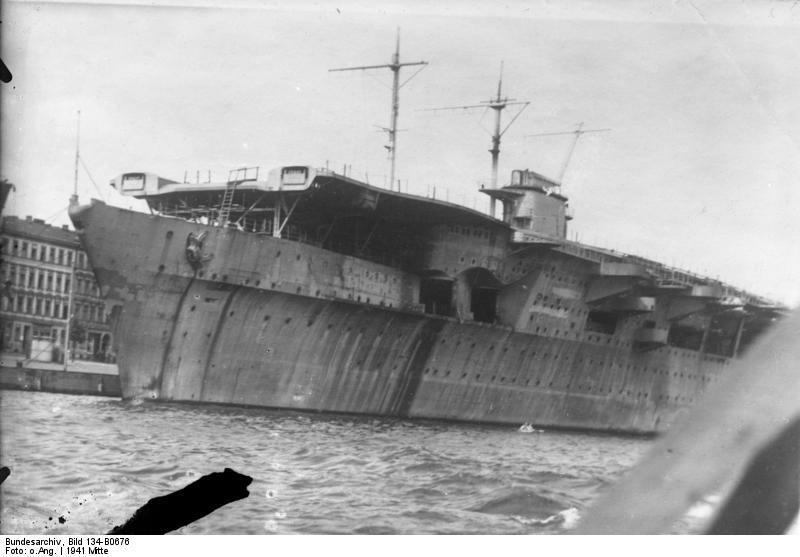 By November, the German army had pushed deep enough into Russian territory to remove any further threat of air attack and Graf Zeppelin was returned to Gotenhafen where she briefly served as a floating warehouse for the Navy's hardwood supply. By the time Admiral Raeder met with Hitler for a detailed discussion of naval strategy in April 1942, the usefulness of aircraft carriers in modern naval warfare had been amply demonstrated. British carriers had crippled the Italian fleet at Taranto in November 1940, critically damaged the German battleship Bismarck in May 1941 and prevented battleship Tirpitz from attacking two convoys bound for Russia in March 1942. In addition, a Japanese carrier raid on Pearl Harbor had devastated the American battlefleet in December 1941. Raeder, anxious to secure air protection for the Kriegsmarine's heavier surface units, informed Hitler that Graf Zeppelin could be finished in about a year, with another six months required for sea trials and flight training. On 13 May 1942, with Hitler's authorization, the German Naval Supreme Command ordered work resumed on the carrier. But daunting technical problems remained. Raeder wanted newer planes, specifically designed for carrier use. Reichsmarshall Goering, head of the Luftwaffe, replied that the already overburdened German aircraft industry could not possibly complete the design, testing and mass production of such aircraft before 1946. Instead, he proposed converting existing aircraft (again the Junkers Ju 87 and Messerschmitt Bf 109) as a temporary solution until newer types could be developed. Training of carrier pilots at Travemünde would also resume. The converted carrier aircraft were heavier versions of their land-based predecessors and this required a host of changes to Graf Zeppelin'soriginal design: the existing catapults needed modernization; stronger winches were necessary for the arresting gear; the flight deck, elevators and hangar floors also required reinforcement. Changes in naval technology dictated other alterations as well: installation of air search radar sets and antennas; upgraded radio equipment; an armored fighter director cabin mounted on the main mast (which in turn meant a heavier sturdier mast to accommodate the cabin's added weight); extra armoring for the bridge and fire control center; a new curved funnel cap to shield the fighter director cabin from smoke; replacing the single-mount 20mm AA guns with quadruple Flakvierling 38 guns (with a corresponding increase in ammunition supply) to improve overall AA defense; and additional bulges on either side of the hull to preserve the ship's stability under all this added weight. The German naval staff hoped all these changes could be accomplished by April 1943, with the carrier's first sea trials taking place in August that same year. Towards that end, Chief Engineer Hadeler was reassigned to oversee Graf Zeppelin's completion. Hadeler planned on getting the two inner shafts and their respective propulsion systems operational first, giving the ship an initial speed of 25-26 knots, fast enough for sea trials to commence and for conducting air training exercises. By the winter of 1943/1944 she was expected to be combat-ready. On the night of 27–28 August 1942, Graf Zeppelin underwent the only Allied air attack ever specifically targeting her for destruction. Nine RAFAvro Lancaster heavy bombers from 106 Squadron were despatched against her, each one carrying single "Capital Ship" bombs, a 5,500 lb device with a shaped charge warhead intended for armoured targets. One pilot was unable to see the carrier due to haze and instead dropped his bomb on the estimated position of the German battleship Gneisenau. Another believed he scored a direct hit on Graf Zeppelinbut there is no known record of the ship suffering any damage from a bomb strike that night. On 5 December 1942, Graf Zeppelin was towed back to Kiel and placed in a floating drydock. It seemed she might well see completion after all. By late January 1943, however, Hitler had become so disenchanted with the Kriegsmarine, especially with what he perceived as the poor performance of its surface fleet, that he ordered all of its larger ships taken out of service and scrapped. To Admiral Raeder, who had often clashed with Hitler on naval policy, this was a stunning setback. In a long memorandum to Hitler he called the new order "the cheapest sea victory England ever won". Raeder was shortly relieved of command and replaced with former Commander of Submarines Karl Dönitz. Though Admiral Dönitz eventually persuaded Hitler to void most of the order, work on all new surface ships and even those nearing completion was halted, including Graf Zeppelin. As of 2 February 1943, construction on the carrier ended for good. In April 1943 Graf Zeppelin was again towed eastward, first to Gotenhafen, then to the roadstead at Swinemünde and finally berthed at a back-water wharf in the Parnitz River, two miles (3 km) from Szczecin (then known as Stettin), where she had been briefly docked in 1941. There she languished for the next two years with only a 40-man custodial crew in attendance. When Red Army forces neared the city in April 1945, the ship's Kingston valves were opened, flooding her lower spaces and settling her firmly into the mud in shallow water. A ten-man engineering squad then rigged the vessel's interior with demolition and depth charges in order to hole the hull and destroy vital machinery. At 6pm on 25 April 1945, just as the Russians entered Stettin, commander Wolfgang Kähler radioed the squad to detonate the explosives. Smoke billowing from the carrier's funnel confirmed the charges had gone off, rendering the ship useless to her new owners for many months to come. The carrier's history and fate after Germany's surrender was unclear for decades after the war. According to the terms of the Allied Tripartite Commission, a "Category C" ship (damaged or scuttled) should have been destroyed or sunk in deep water by 15 August 1946. Instead, the Soviets decided to repair the damaged ship and it was refloated in March 1946 and enlisted in the Baltic Fleet as aircraft carrier Zeppelin (Цеппелин). The last known photo of the carrier shows it leaving Świnoujście (before 1945 Swinemünde) on 7 April 1947 . The photo appears to show the carrier deck loaded with various containers, boxes and construction elements, hence the supposition that it was probably used to carry stolen factory equipment from Poland and confiscated from Germany to the Soviet Union. For many years, no other information about the ship's fate was available. There was some speculation that it was very unlikely that the hull made it to Leningrad, as it was argued that the arrival of such a large and unusual vessel would have been noticed by Western intelligence services. This seemed to imply that the hull was lost at sea during transfer between Świnoujście and Leningrad. One account concluded that it struck a mine north of Rügen on 15 August 1947, but Rügen, west of Swinemünde, is not on the sailing route to Leningrad. Further north in the Gulf of Finland, a heavily-mined area difficult for Western observers to monitor, seemed more likely. After the opening of the Soviet archives, new light was shed on the mystery. Though some believed that the carrier had been towed to Leningrad after the war, in his book "Without wings, the story of Hitler's aircraft carrier" Burke disputed this. What is known is that the carrier was known as "PB-101" (Floating Base Number 101) in 3 February 1947, until, on 16 August 1947, it was used as a practice target for Soviet ships and aircraft. Allegedly the Soviets installed aerial bombs on the flight deck, in hangars and even inside the funnels (to simulate a load of combat munitions), and then dropped bombs from aircraft and fired shells and torpedoes at it. This assault would both comply with the Tripartite mandate (albeit late) and provide the Soviets with experience in sinking an aircraft carrier. According to Soviet sources, on 19 March 1947 the Council of Ministers decreed destruction of former German ships. The first capital ship, Lutzow, was sunk off Swinemunde on 22 July 1947. On 14 August Zeppelin was towed into the harbor, and two days later to its final resting place. It was subjected to five series of controlled explosions of 180-mm shells and FAB series bombs. The first series imitated a FAB-1000 detonation in the exhaust funnel and lesser bombs below the flight deck. The second series was a single FAB-1000 explosion above the flight deck. The third, the fourth and the fifth series imitated penetration of FAB-100, FAB-250 and FAB-500 bombs at flight deck, hangar deck and gun battery deck levels. These bombs were placed in cutouts in their target decks to imitate effects of dive bombing. Zeppelin remained afloat, and admiral Yury Rall ordered a torpedo strike. A torpedo fired from an Elco PT boat exploded in the anti-torpedo bulge and did not penetrate belt armor. A torpedo fired by Destroyer Slavny penetrated the unprotected hull section below the bow elevator; Zeppelin sank 25 minutes later. By this point, the Cold War was under way, and the Soviets were well aware of the large numbers and central importance of aircraft carriers in the U.S. Navy, which in the event of an actual war between the Soviet Union and the United States would be targets of high strategic importance. After being hit by 24 bombs and projectiles, the ship did not sink and had to be finished off by two torpedoes. The exact position of the wreck was unknown for decades. 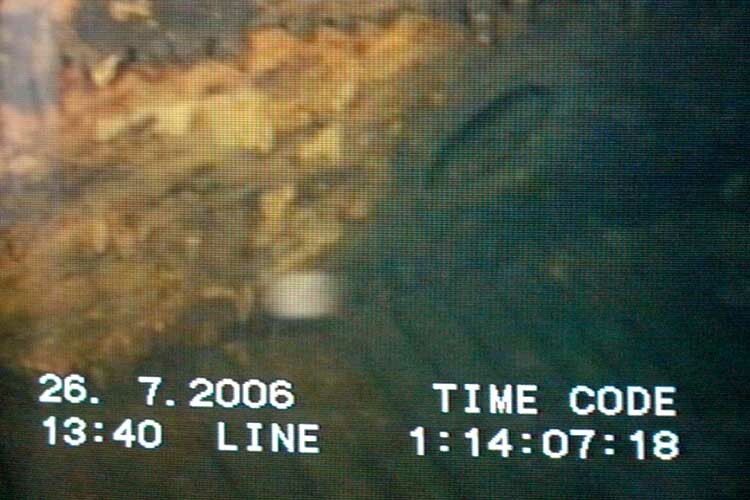 On 12 July 2006 RV St. Barbara, a ship belonging to the Polish oil company Petrobaltic found a 265 m long wreck close to the port of Łeba(a BBC report says 55 km north of Władysławowo) which they thought was most likely Graf Zeppelin. 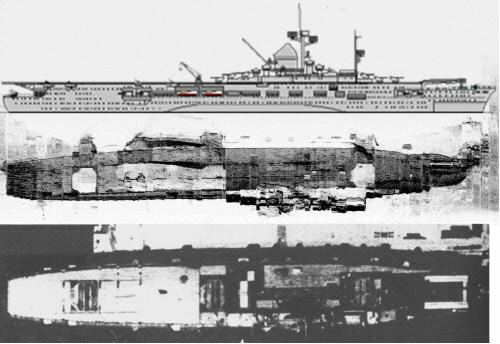 On 26 July 2006 the crew of the Polish Navy's survey ship ORP Arctowski commenced inspection of the wreckage to confirm its identity, and the following day the Polish Navy confirmed that the wreckage was indeed that of Graf Zeppelin. She rests at more than 87 meters (264 ft) below the surface. 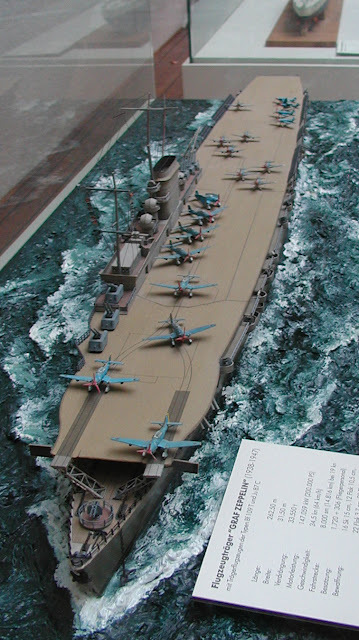 A scale model of the Nazi aircraft carrier the "Graf Zeppelin" shown in the German Shipping Museum in Bremerhaven in 1998. 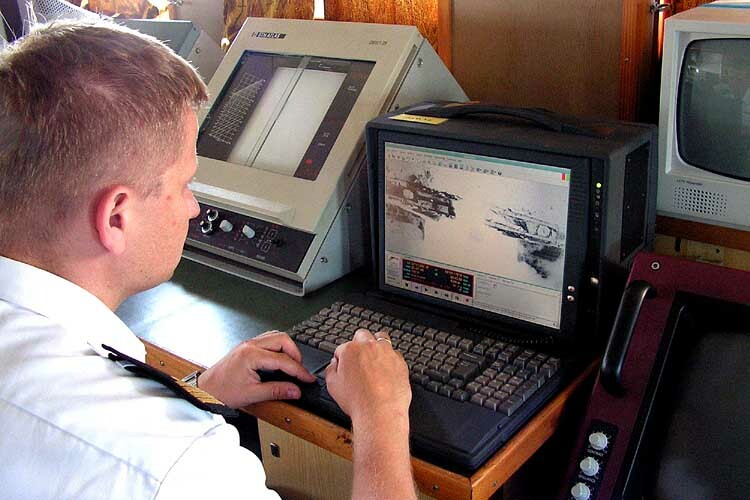 A sonar graph representation from the Polish Navy. 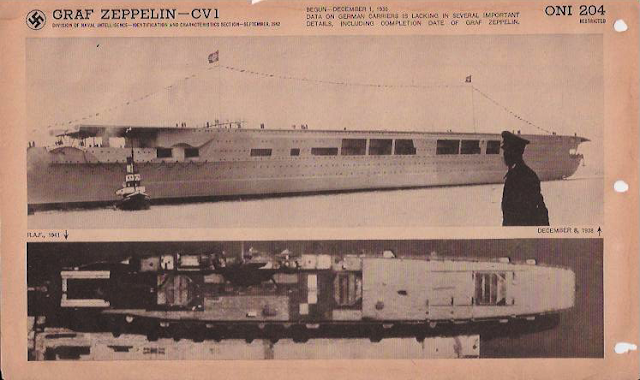 The "Graf Zeppelin" was discovered in the Baltic Sea off the Polish coast by a Polish company that specializes in searching for oil reserves. 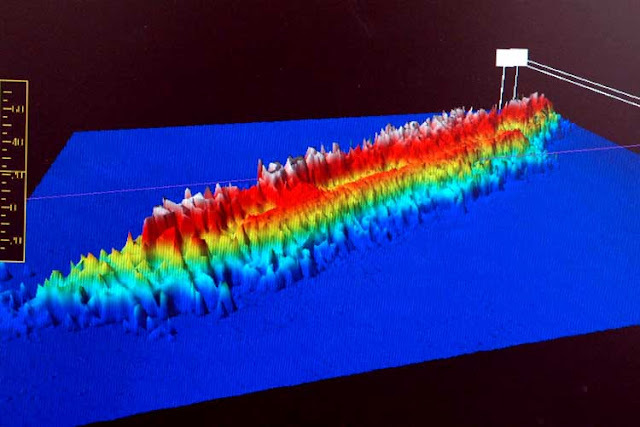 A topographic picture shows the wreck in 3-D.
A picture from an underwater camera taken at a depth of 80 meters (260 feet) -- too far down for conventional scuba divers. Only specialists can reach the ship with a particular blend of oxygen, nitrogen and helium. 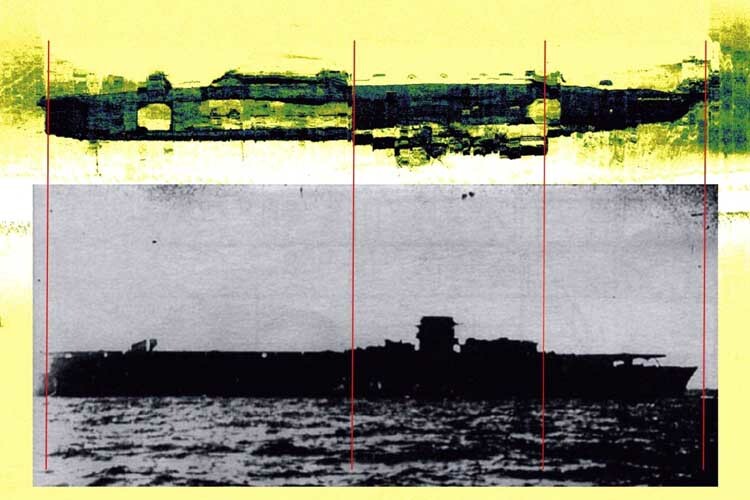 A sonar picture of the wreck and an original photo underneath: Experts think that the detailed similarity of both images proves that it is the same ship. A Polish Navy officer is examining a sonar picture of the shipwreck, which lies some 55 kilometres (34 miles) north of the Polish port of Wladyslawowo. In 2009 a team of scuba divers obtained permission from the Polish government to dive the wreck. The depth and conditions of the wreck mean that only advanced technical divers can realistically contemplate such a dive, but in any event, permission needs to be obtained from Polish authorities for any diving activities. Most of the team arrived in Gdansk, Poland on Monday May 4, 2009 to find the weather conditions unfavorable for leaving port. The wind was blowing 15 - 20 miles per hour and the sea 2-3 meters / 6 - 9 ft, so we sat in port and enjoyed the fine cities of Sopot, Gdansk and Gdynia, Poland. Despite a previously failed attempt at the dive in November 2008 due to bad weather, spirits were high and enthusiasm for the project was strong. On Wednesday we had a team meeting and the word was maybe “Thursday evening” we would leave, but again the weather conditions were uncooperative so chances were slim. We continued to explore the cities, going to the various tourist attractions like the old city and the Display of the Transformation of Poland from 1970-1989. Spirits were starting to dampen, until finally word came down to load the ship Saturday morning for departure that evening; we had to wait for the Hyperbaric Doctor to get back from his trip Stockholm. Enthusiasm for the project was now at an all time high. We met at Lukasz P. ‘s dive center at 10:00 am and had a little meeting, in Polish of course, explaining what each person’s role would be in loading the ship that day. Sebastian, the project lead, divided the group into teams and assigned roles in loading. One team was to load all compressors and filling equipment, the other tanks and stages, and the third the decompression chamber and secure it to the ship. So off we went, loading up the vans and gear and heading for the port. We arrived to find a 200’/60m+ length ship. WOW. I mean this is a diver’s dream. Huge diving deck, incredible diver deploy and retrieval system. What diving ladder? They simply put us in the water and retrieve us from the water with this cage. We also used it to load and unload the gear from the ship. After that we went over the safety aspects of the week and the diving protocols and so on. Once the meeting was completed we were free to finish stowing any remaining gear for the overnight trip to the wreck. We met the Coast Guard and Customs officers at midnight to ensure our paperwork was in order as we were exiting the European Union (EU.) The wreck lays in International water and so you exit like you are leaving the country and then need to re-enter when you come back. When we wake, we will be sitting at the dive site 40 miles off shore. Sunday May 10 - Dive Day 1. I woke around 5 am filled with excitement. Could hardly wait to slide down a cup of coffee, brush my teeth and hit the water. But of course no luck yet, we were still under way and when we arrived they needed to drop the buoys on the site. Did I mention the buoys, take a look at the picture of them on the deck. Now that’s an upline :) Yes the Polish Maritime Office has allowed us to use their ship to dive from, which they use to set channels markers for the shipping lanes. So of course we took advantage of their resources LOL. Following that the maritime office wanted to run a side scan sonar over the wreck to get some more data and sonar images. In the mean time, we had a team meeting where Sebastian went over the plan and objectives for each team’s dive followed by a discussion from the Hyperbaric Doctor about what to do in emergencies. The doctor then took us for a tour of the onboard decompression chamber followed by a little taste of the inside of the deco chamber. Four of us at a time crawled into that little space to experience the tightness and go over some of the procedures in the event of a DCS problem. Finally it was time to go. We were the first to dive. What an honor to be the first sports divers in the world to be on the Graf Zeppelin, and an even bigger honor to be the first team to dive her. Lukasz, Tymek and I have a quick meeting about our duties. Essentially I will lead the team down the upline, ensure the upline is secured to the wreck, place the strobes on the upline, tie the reel to the upline and run line towards the stern, surveying the deeper area/side. We are to place a sort of permanent guideline over the area we have covered. Tymek is to hold the video lights shedding light for Lukasz the video man. Sounds excellent. We suited up and proceeded to jump in. Everything went really smoothly on the surface deployment from the ship and then we had to scooter 300’/100m to the buoy. It’s time to dive. We descend and I stop at 10m/30’ allowing Lukasz to get the camera ready. He gives the “good to go” sign and I hit the CUDA trigger and down we go. This is probably one of my favorite times in exploration diving: descending into the abyss and waiting for the wreck to appear in the murk. Visibility is about 15’ - 20’ / 5m - 7m, water temperature 2.6c / 35 F with little to no current. Just excellent diving conditions. Finally she appears. A massive, massive wreck. I quickly survey the area for a tie point and then secure the downline to the wreck, attach the exit strobes to the downline, and attach the guideline. Duties are done and we are ready to explore. Time to hit the trigger. We landed on the rear section of the super structure so we decided to head towards the stern. One of the more obvious things that strikes me is how the entire flight deck, which is wooden, is in perfect shape.This is really unique to Baltic diving. The cold deep and salinity, or lack thereof, preserve the wood condition. Continuing along the deck, I notice how the flight deck has broken and the large crack makes it seem like a folded card. But the fold is upward not downward. This shape would only be caused by an explosion inside the ship, as the deck is folded up , tent shaped. As we continue along this massive flight deck, Tymek describes it as diving an “air field”. I think that best describes the feeling. We find one of the massive loading holes and see the aircraft lift. We descend down into this plane loading area, exploring around and reaching a max of 230’/70m. After entering into the flight deck and tying off the line, we find ourselves already out of penetration bottom runtime, 17 min bottom time, and so it is time to turn and return home. Back to deco. We run Ratio deco for 220’/66m and bottom time 20 min, a total run of 90 minutes. When we surfaced, we signaled the team all OK and we returned to the ship to be loaded. As we were the first team to dive, we would be the first team to try the new lift cage. I am up first. Whooooa.... what a ride back onto the ship. I think the pictures are worth a thousand words. After the dive we drink hot tea, eat a quick meal, and follow it with a video review session. The room fills with the crew from the boat and the other diver in anticipation of seeing the first ever footage of divers on the wreck. We have a scheduled dive time of 8:00 am, so we get up around 6 to get ready, have a light breakfast, prepare the equipment and have a team meeting before we hit the water. This time we are going to dive the second decent line which is on the port side of the ship and slightly shallower. Our goal is to drop down the side of the ship, run a line towards the stern, and check out the rooms, gun balconies and the side of the ship below the flight deck. We descended to find a light current pushing us off the wreck, but not to seriously, and that we would be hiding in the ship shadow once we attached the guideline and dropped down the side of the wreck. I personally really enjoyed this dive as we were able to cruise along exploring each room, one by one. The rooms were connected to one another by doorways which we would slip through. I also noticed these large air conditioning pipes and other remnants of this massive floating city. I passed through one doorway onto a balcony for a gun. Reviewing the plans later, we believe it to be the place for the anti aircraft guns. Of course no guns were present as the Russians removed them before they used the Graf Zeppelin for target practice. We continued to run line almost to the stern when we hit our turn time and raced back to the upline. Oh the joy of scooter diving. Our average depth on this dive was 200’/60m with a bottom time of 20 min giving us a nice clean deco. After the dive we grabbed early lunch, some hot tea. and reviewed the video. Simply amazing dive. For our second dive that day, we decided to explore the super structure located midship, starboard side and at the bottom of the first descent line that we dove the day before. It is located at the back of the super structure. This time we would head in the opposite direction towards the bow and video the entire super structure. We decided to explore the area much slower this time, allowing time for the video and lightning to set up different angles to get the best shots of the super structure. We would take the scooters as they are really valuable to get down the upline quickly and then once the exploration is completed we could jet back to the upline rather than have to swim it. It was time to rock and roll. The support team did an excellent job of getting us in the water and off we went descending the downline. There was no current and visibility was about the same 20’/6m - 30’/9m. We explored around the super structure which was really breathtaking. There were a variety of rooms and entrance ways with few artifacts in each room. We penetrated into one of the rooms taking a look around. I noticed something very different about this Naval Ship than diving the HMS Repulse: the rooms are empty and void of any signs of life or feelings of battle. This ship was never in service and was only used for experiments by the Russians. It has a very different life and feel inside: it’s an empty vessel that was never filled with a soul. This was our surface support day. Our wakeup call was 5:00 am to prepare the deck for the other teams. First dive is at 6:00 am and we needed to put the teams in the water and run surface support. No diving for our team unless another team bails or they get done before 5:00 pm. As the day progressed a storm built and the diving operations were ceased by the captain and we were told to breakdown the gear and stow it for the rough and windy night ahead. We stayed out, but if the weather remained bad we would return to the port in the morning. We woke up to good weather (great weather in fact) and the seas were perfect for diving. At around 7:00am we are told by the captain that we should prepare for diving that day. But first the maritime office would need to place the down line on the Bow Section. In the meantime, as we were team one, we needed to get our gear together as quickly as possible. As we were assembling our gear, and because I got so cold the last dive, I asked Jan to borrow his passive heating vest, to see if it gave me anymore warmth or protection. It sure did look strange but we would see if it worked. We had planned to dive the Bow of the wreck. The maritime office had laid a new down line on the bow section, therefore we could descend directly onto the bow without wasting time. Lukasz wanted to film our team descending on to the bow and then we would do some penetration into the bow section. We were not allowed to jump from the ship, so we were “air lifted” down into the water. Such a cool experience. Once we touched the water we could scooter off towards the Bow Section Down line about 300’/90m away. All went really well that morning and the three of us descended around 8:50am. We stopped at 30’/9m to allow Lukasz to square the camera away and then we continued down. This time I stopped at 170’/51m allowing Lukasz to catchup and pass me heading down to the wreck. I could almost see the wreck from my depth without Lukasz’s light but as he descended closer to the wreck his lights illuminated the bow section. Such an incredible sight. Indescribable. He then turned and put the camera on us and we then continued our decent to the wreck. Once I arrived I would need to tie the line to the wreck. I noticed a perfect spot just a few feet away. So I pulled some line down towards the wreck creating some slack in the downline to tie with. When I tied I gave it one good tug and the tie point broke. So I tried another, this time before tying the line, I just simply tugged on the bar and it broke. So I tried another and it broke. Ok I thought now I have to search for a place to tie that is stronger than those rusted metal bars. I finally find a thick section of the bow catapult. The aircraft carrier has a catapult on the bow to sling the aircraft down the runway, so the aircraft can gain needed speed quickly for take off. We then explored the catapult on the runway deck and then descended down to the second level and then the third level to begin our penetration into the forward section of this monster. It was as though we were being swallowed by a giant sea monster. and decided to grab a hold of the chain to feel it’s enormous size and get Lukasz to take some video so the viewer could understand the sheer enormity of this chain. Each link is bigger than my hands in width and the circumference of the metal is twice that of what I can wrap my hands around. Just massive. We then continued to explore around the anchor area looking at the massive cleats which they use to tie the ship up. We exited the side of the wreck and started to explore the forward gun balconies with their distinctive wave shape above the guns. This was unique to the Graf Zeppelin. Before we know it, it’s time to turn and return to the upline. The average depth for the dive was 220’/66m and 20 min bottom so we have a run of 90 min. This was one of the best dives of the project for sure. As a side note, I wasn’t cold so I guess this extra vest might of worked. Then it was time for hot tea, lunch and refill for the afternoon dives. The wind and weather started to pick up again around one and by 4:00 pm the Captain had called the dive and the project. Weather forecast and swell prediction made it impossible to dive the remainder of the day or the following day. So the captain decided to return to port. This of course was a massive shock and disappointment to the team but it was the captain's decision. As you can well imagine, the sentiment on the trip home was not unhappiness about the project being called early, but thankfulness for the 4 dives we did manage to get. 13 ^ Alexander Shirokorad (2004, in Russian). Флот, который уничтожил Хрущёв (Flot, kotoryi unichtozhil Khruschev). AST publishers, ISBN 5960200279. pp. 108-112. 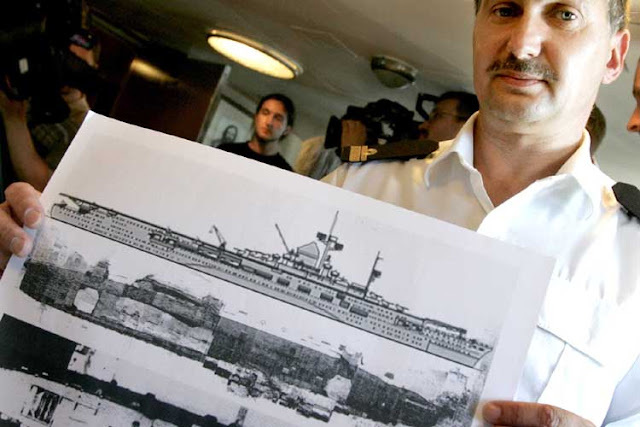 16 ^ "'Nazi aircraft carrier' located". BBC News. 28 July 2006. Barker, Lt. Cmdr Edward L. (March 1954). War Without Aircraft Carriers. United States Naval Institute Proceedings. Breyer, Siegfried (1989). The German Aircraft Carrier Graf Zeppelin. Atglen, Pennsylvania: Schiffer Publishing Ltd.
Breyer, Siegfried (2004). Encyclopedia of Warships 42: Graf Zeppelin. Gdansk: A.J. Press. Brown, David (1977). WWII Fact Files: Aircraft Carriers. New York: Arco Publishing. Burke, Stephen (Sept 2007). Without Wings: The Story of Hitler's Aircraft Carrier. Trafford Publishing. ISBN 1425122167. Chesneau, Roger (1998). Aircraft Carriers of the World, 1914 to the Present An Illustrated Encyclopedia. London: Brockhampton Press. pp. 288. ISBN 1 86019 87 5 9. Green, William (1979). The Warplanes of the Third Reich. New York: Doubleday and Company, Inc.
Green, William; Gordon Swanborough (1994). The Complete Book of Fighters. Salamander Books. ISBN 0-8317-3939-8. Israel, Ulrich H.-J. (1994). Graf Zeppelin: Einziger Deutscher Flugzeugträger. Hamburg: Verlag Koehler/Mittler. Israel, Ulrich H.-J. (2003). "Flugdeck klar!" Deutsche Trägerflugzeuge bis 1945. Flieger Revue Extra. Marshall, Francis L. (1994). 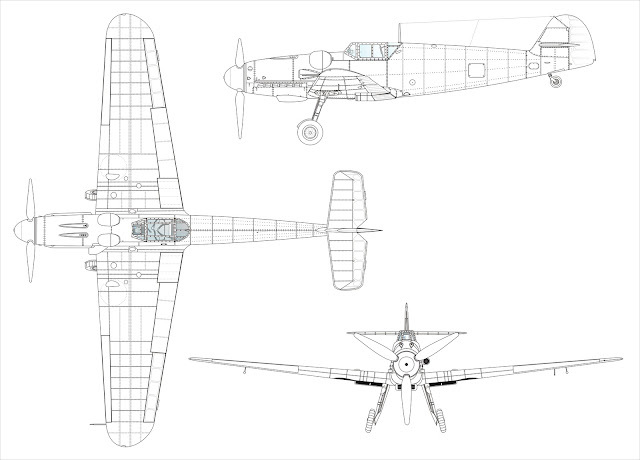 Sea Eagles - The Operational History of the Messerschmitt Bf 109T. Walton on Thames, Surrey, UK: Air Research Publications. Reynolds, Clark G. (January 1967). Hitler's Flattop: The End of the Beginning. United States Naval Institute Proceedings. Smith, Peter C. (1998). Junkers Ju 87 Stuka. Ramsbury: The Crowood Press.